Riddles in the Dark: Q&A with us! Suprise! It's Sssneaky Sunday, so we surprising it by posting its questions! We got lots of questions about us. We thought it would just want to ask us for help with it's problems, but it wants to know about us! Smeagol is very happy that our readers care about us. We don't have any friends, but readers make us happy, yes they do precious! We likes The Lord of the Rings, of course! Three long movies with us! And we do very, very well in them. We should win an Oscar, yes precious! We don't like The Hobbit quite as much. No, not very much at all. We thinks Andy Serkis is doing a very good job but there is too much of Baggins. Our other favorite is O Precious, Where Art Thou? 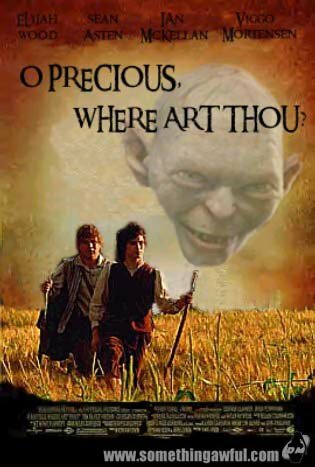 We can very much relate as we tries to find the Precious. Yes, we answered the second question. We hates.... We hates anyone who tries to take our Precious! Baggins, he stole it from us. We lost it for a very long time. We didn't know what to do. Then Master tries to hurt the precious. We hates Master. No, no we don't. We likes nice Master. Yes we do hate it! We only need me! Not nasty hobbitses who trick us. We need me to get back the Precious. No, no, we don't need it now. We want it to go away. Hehehe, it wants us to leave? It can't do anything without us. We doesn't like the Baggins who took the Precious, but nice Master looks after us. He keeps the Precious away from us! We hates it too! Dearest Smeagol, How dost thou plan to have fun in the summer hot time?? The Yellow Face, always spying in the summer. No, we don't like it. Always showing where we are. It hurts our eyes. We hides. We waits. Stream and pool is wet and cool... We will go to a nice place. No hobbits following. No nasty orcses or wicked men. Just Smeagol. Yes, just us. Fissh, we can get many nice fish while we stay cool. Do you prefer to be called Smeagol or Gollum? Where did you come up with the song 'Naughty Little Fly?' Did you make it up yourself? Smeagol is our name. It can call us Gollum if it likes. Smeagol doesn't mind. But do not call us sneak! We writes nice blog for it, we posts two times a week, so don't call us sneak! Did we makes it up? Did we. Long ago, yes, yess. We heard it, so very long ago, when Smeagol was happy and free. But we thinks of it when Master gets caught in a web. And we comes up with the new ending! We are quite good with songs. We know very many. Have you ever used the rings power to prank anyone? Smeagol likes sssneaking, and we used our Precious very much. We goes to take nasty orcses to eat. We use our Precious then. If we had the Precious later, we would sneak up on the fat hobbit. Sneak up on him in his sleep! We would give him a fright. Smeagol could laugh! The fat hobbit would be so surprised! where do you buy your loinsloths from? What does it ask?? We are not going to tell it that! But we tells it one thing. We doesn't go to the GAP of Rohan! "O Precious, Where Art Thou?" and "Gap of Rohan" ROFL! Great answers, humorous as always. Sméagol you have excellent taste in film, better than people for sure. James - Yes, yes we do! We are glad that it thinks we are funny. We are practical. If we have the Precious, we should use it!